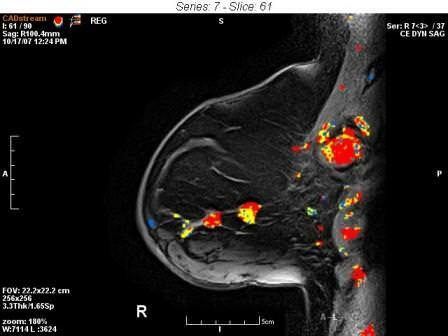 What is MRI of the Breast? Detailed MR images allow physicians to evaluate various parts of the body and determine the presence of certain diseases. MRI of the breast offers valuable information about many breast conditions that cannot be obtained by other imaging modalities, such as mammography or ultrasound. It is important to tell us if you have any implanted electronic devices such as a pacemaker, defibrillator, or any metallic devices such as surgical prostheses, stents, surgical clips. Please inform us If you have had any recent surgery as this could effect the exam. Also please inform us if you have had any metal particles in your eye or are exposed to metallic particles in your work place. The information in this site is not intended to diagnose or treat any medical conditions. If you have a medical condition consult your doctor.